LAMP is basically a software bundle made up of open-source softwares ( Linux – Apache – Mysql or Marimba – Php / Perl / Python ) . LAMP refers to the first letters of each component . This article explains the installation and configuration of LAMP on linux mint 13. Install LAMP on linux mint 13. LAMP installation in linux mint 13 is very simple, we can install using a single command . Press ALT + CTR + T to open terminal. Step 1 » Update the repository. 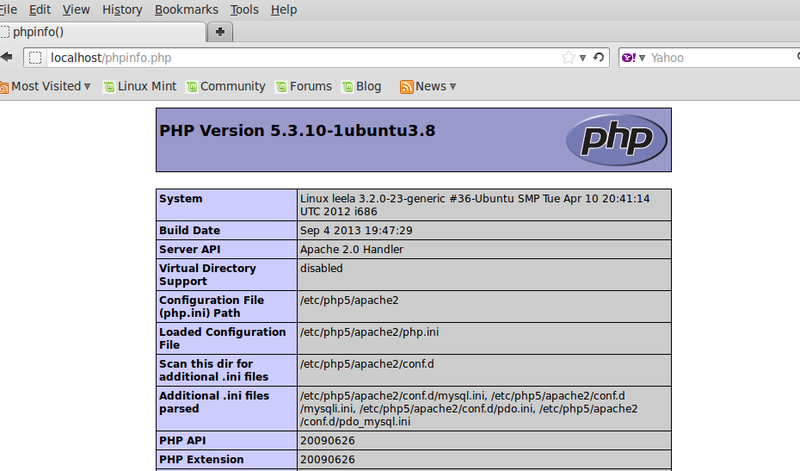 Step 2 » Issue the below command to install apache,mysql and php along with dependencies. krizna@leela:~$ sudo apt-get install lamp-server^Don’t forget to include ^ [caret symbol] at the end. Now you have successfully installed LAMP ( Apache , mysql and php ). Step 4 » Now add the below line to /etc/apache2/httpd.conf file to avoid warning during apache service restart. Step 5 » Restart apache service . Now check the installed components one by one. Step 6 » Open http://localhost or http://youripaddress (http://10.0.2.15) in your browser. you can see the page like below. Step 7 » Type the below command in the terminal and type your mysql root password which is created during the installation.You can login to your mysql database and can see the below things. Step 8 » Create a file /var/www/phpinfo.php and add the below code . 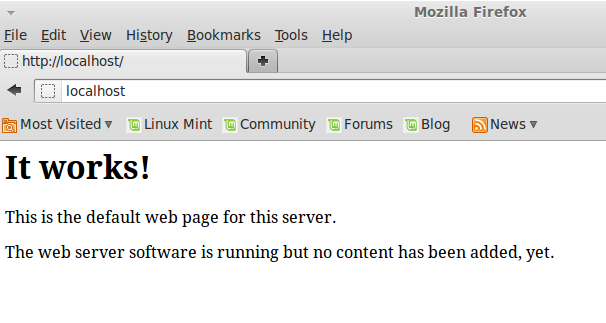 Now open http://localhost/phpinfo.php in your browser. you can see the page like below. You can see all the configuration details in that page . We can test mysql connectivity through php. Create a file /var/www/dbtest.php and add the below code and replace your dbpassword in that code. Now open http://localhost/dbtest.php in your browser. you can see the msg “Congrats! connection established successfully” ..